Most people take up a new hobby when they retire from work, but not many look for one that is as dangerous as the 64-year-old who has decided to spend his days windsurfing. MOST people take up a new hobby when they retire from work, but not many look for a past time that is as dangerous or death defying as Liu Chunyang. The 64-year-old has decided to spend his days at the beach and windsurf in his spare time. The joy of being part of the sea, the freedom and strength, while surfing against the wind, and the thrills and spills on the waves is what appeals to the old timer, time and time again. The good conditions attracted Liu to Hainan for six years now. 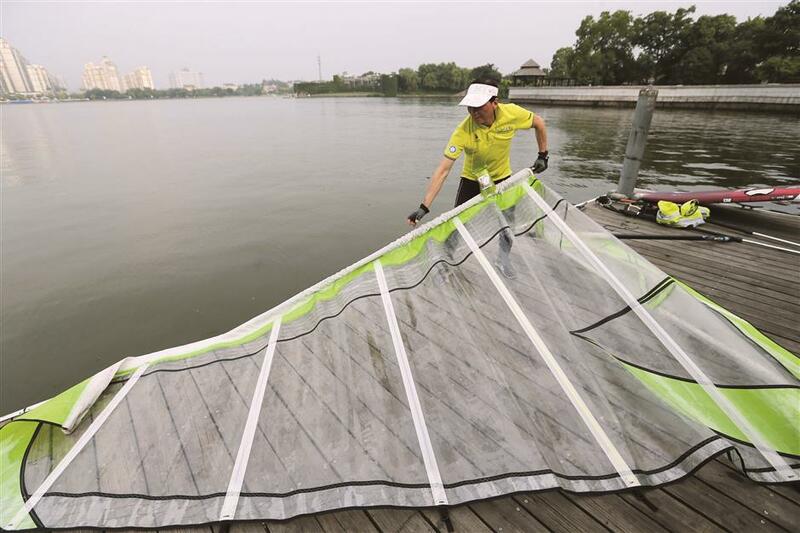 He passed an early qualification test in windsurfing and sailing, in Haikou, capital of Hainan, the year before he retired. Liu was inspired by excitement he gained watching surfers prior to taking to the waves. And what impressed him more than anything else was that there was a large amateur presence. Liu Chunyang installs the sail and rig. Windsurfing is tough for a starter and Liu admitted he often fell into the water. The retiree admitted it took him a couple of months to get familiar with the boards, under the instructions from coaches, let alone practice more difficult skills. “Surfing is a little like life, every element is unpredictable and uncertain, and you need to balance and manage with your own body,” he said. Liu said he enjoyed the process in learning how to deal with the changes of wind force, direction of the wind and the waves on his body. The exploration of this new knowledge made him feel excited. And since taking up windsurfing, his body index, such as blood pressure and blood fat has improved. Even his abdominal and chest muscles have become more prominent. 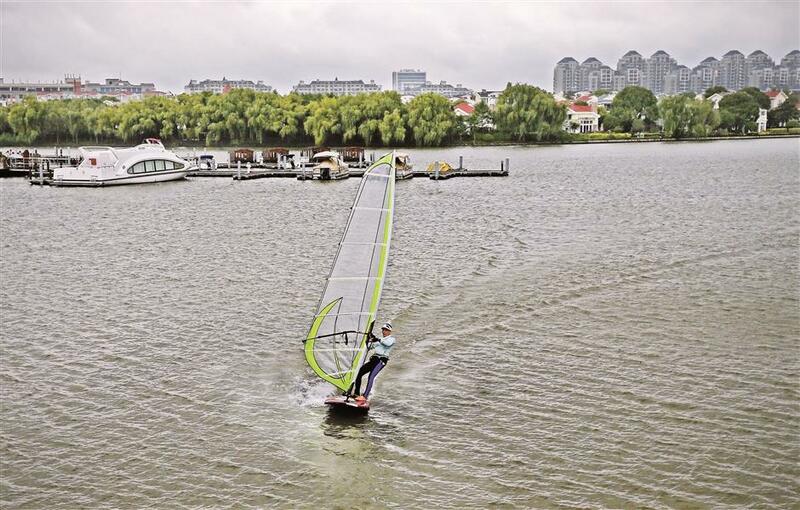 Under Liu’s influence, his son-in-law and grandson took up windsurfing as well. Liu signed up his grandson to a windsurfing summer camp. “The premise to learn windsurfing is actually quite simple. You just have to know how to swim, so that you can get back on to the board after falling in water,” he said. The only drawback Liu has found since taking to the waves is the age restriction in windsurfing competitions. Most competitions in China are not set up for different age group categories, and participants are usually required to be in-between the 18 and 65-year-old age bracket. Liu and several of his friends are about to hit 65 next year and soon won’t be able to compete after that. He hopes in the future that the country’s yachting association can set up age groups so more elderly players can continue to enjoy the fun of windsurfing. 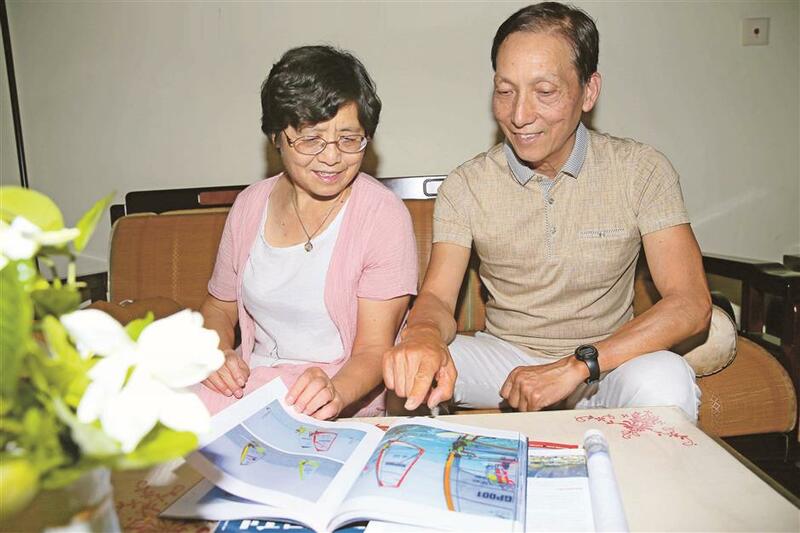 Liu Chunyang shares his windsurfing stories with his wife.